Olivia Reyes serves as the Archives Assistant for the Oklahoma Hall of Fame. Her duties include assisting in preserving and cataloging historical documents and managing various digital humanities platforms. A native Oklahoman, she was born in Midwest City, Oklahoma, and attended the Oklahoma School for Science and Mathematics for high school. She went on to earn her Bachelor of Arts degree in Global Art and Visual Culture from the University of Central Oklahoma in 2018, and is currently pursuing a Masters of Arts in History degree at UCO. 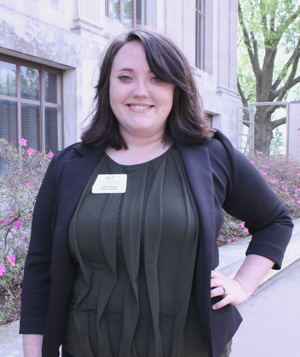 She has a published paper in the 2017 issue of 1890: A Journal of Undergraduate Research, and has presented research at conferences at the local, national, and international level. Olivia currently resides in Midwest City with her husband Sergio, their cat Marble, and their hedgehog Courage. In her spare time she enjoys spending time with family and creating stone sculptures.